It’s fair to say our daily lives are in the midst of an ongoing ‘digital revolution’. So many day-to-day aspects of our lives have now been digitised — no more so than in our homes where technology plays a considerable role in how we do simple, everyday tasks. So it figures, we expect the same if we’re staying at a hotel when travelling — essentially a ‘home away from home’. This has definitely begun in a whole host of areas ranging from check-in to temperature control. And one such area that is benefiting from the rise of technology is the bathroom. And these innovations aren’t just making life easier and more convenient, but can now offer a personalized, luxurious touch as well. 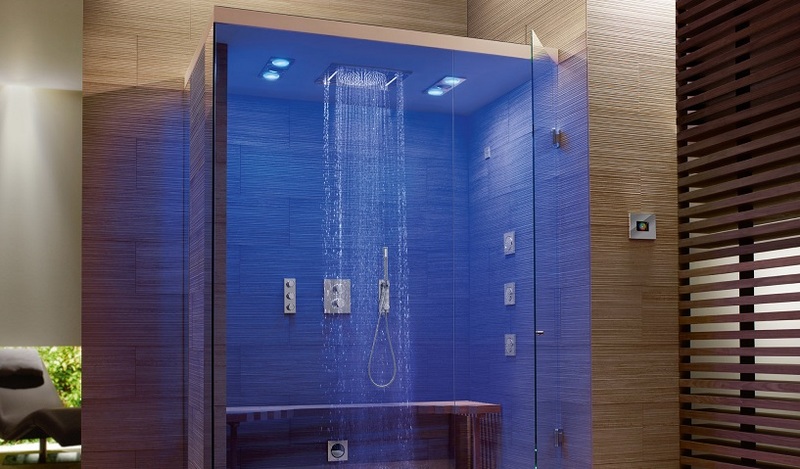 This shower is an amazing example of the use of color in bath design. Intuitive operation for enhanced comfort What all digital GROHE products have in common is that they can be operated intuitively – their user interfaces are simple to understand and self-explanatory, designed to make life easier for the user. At the same time, they incorporate modern technologies to create unique water experiences, which users can enjoy time after time. Technologies for personalized luxury GROHE F-digital Deluxe takes the concept of luxurious and personalized showering to the next level. 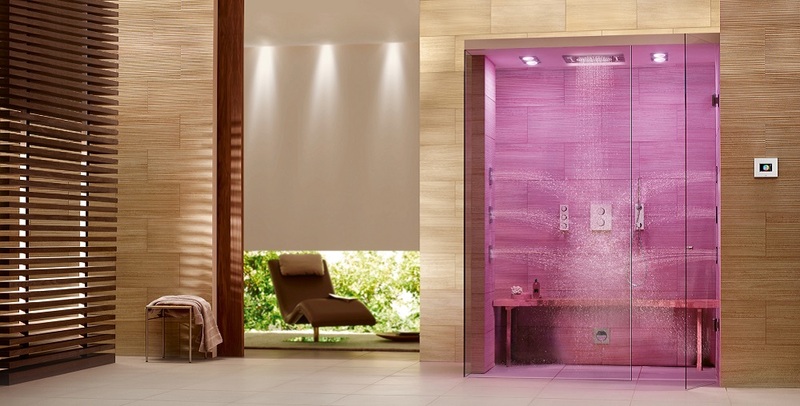 A user can simply select a colored GROHE Sensia® shower toilets also offer high levels of user comfort. Their cleansing functions can be set and activated via a remote control unit or, for the Arena model, via an app. Simple, intuitive symbols on the keys or touchscreen provide direct access to all functions. All settings – including the temperature of the water, the pressure of the spray and the position of the shower arm – can be personalized to meet each user’s individual needs and preferences. I have to believe this is just a display of what that toilet looks like, I would not choose this open design for the toilet in this part of the room, it’s not private at all. What do you think? Leave a comment below. 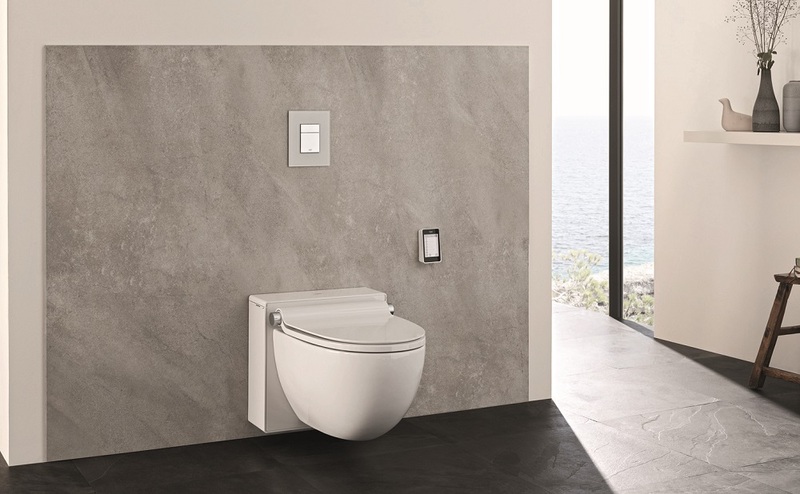 GROHE Sensia® shower toilets also offer high levels of user comfort. Their cleansing functions can be set and activated via a remote control unit or, for the Arena model, via an app. Simple, intuitive symbols on the keys or touchscreen provide direct access to all functions. All settings – including the temperature of the water, the pressure of the spray and the position of the shower arm – can be personalized to meet each user’s individual needs and preferences. All digital products from GROHE are designed to enhance their users’ daily lives and create distinctive and enjoyable experiences. In addition, many digital functions also help to save water and energy, allowing users to enjoy a deeply relaxing shower, while also feeling good about saving water and energy. Check out some of the coolest bathrooms anywhere. US hotel company Starwood has become the first American firm to agree a deal with the Cuban authorities since the revolution of 1959. Starwood will renovate and run three hotels in the Cuban capital, Havana. A spokesman for the company said they would be making a “multimillion-dollar investment to bring the hotels up to our standards”. The news comes on the eve of President Obama’s visit to the island – the first by a US president in almost 90 years. The BBC’s Will Grant, in Havana, says the deal is a welcome reminder of how far things have come between the two nations since they decided to normalize ties. With this visit, and such economic steps, the two sides hope the new ties will soon be irreversible, our correspondent adds. Tourism in Cuba is at an all-time high, including a sharp rise in the number of US visitors, especially since travel restrictions were eased by President Obama. Starwood is currently the target of potentially the biggest takeover of an American company by a Chinese business. Anbang Insurance, which already owns New York’s Waldorf Astoria, has made a $13bn bid for Starwood, trumping an offer by America’s Marriott International. Anbang’s founder, chairman and chief executive Wu Xiaohui is married to Zhuo Ran, grand-daughter of Deng Xiaoping, the country’s former leader who is credited with engineering China’s economic reform. President Obama arrives in Cuba for a historic visit marking a new chapter in US-Cuban relations, dogged until recently by decades of Cold War animosity. Hotels have become more than a utilitarian solution to finding a place to lay your head for the night when you’re away from home. Now competing with not just each other, or a favorite cousin’s extra bedroom, hotels are competing with the likes of Airbnb or couchsurfing.com. And like so many other companies in the new economy – modern hoteliers are trying to figure out exactly what consumers want. We surveyed a range of news reports, studies and general articles to learn just that. Researchers have found that the Millennial generation (those born from 1980- 1996) value experiences over things. But don’t just feel that this just applies to only your Millennial customers. This can be applied in general to the over all hotel experience across all generations. It used to be that “experiences” meant how well a hotel treated a guest: just a different word for customer service. Modern hotel design goes beyond the literal customer service sense of that definition and realizes that “experiences” include how your guests engage or interact with the actual room or hotel property. The experience isn’t just human. It’s tactile. It’s visual. As ehotelier.com found, “luxury is not just about having a great looking interior, it has to feel good too.” From luxurious nap of your couches to the sheen of your bathroom fixtures, your customers “engage” and “relate” – judging your hotel every step along the way with every finishing, furnishing and floor covering. The trend towards classic, quality furnishings, rich textures, and intensely saturated colors provides a foundation. But this also gives you an opportunity to judiciously use color, culture and local flair to create interest throughout your hotel. Think of your hotel color palate like a wardrobe: picking rich, high quality foundational items allows you to “splurge” on interesting aspects that make your hotel memorable. One way to keep your hotel from looking like a cookie cutter of every other well appointed hotel is to take inspiration from your locale or local culture. • Highlight local artists in your rooms and entry areas. • If you’re near the beach, pull nautical elements such as sand or driftwood or sea glass into your decorating scheme. • Even locally sourced, luxury bath products specially created for your hotel, say “luxury” in a way that speaks to your guests senses. As ehotelier.com has previously shared, “hotels are becoming destinations themselves.” So destination planning isn’t just thought of in terms of a locale or city (ie: Orlando) but rather in terms of the specific experience or care a traveler wants in that city. So for example, a family might say they want to stay at Disney’s Animal Kingdom Lodge or Cabana Bay Beach Resort. Travel has always been a series of personal choices. Today – it’s even more so – and so personalization is key. Another example of the convergence between personalization and luxury is in the hotel bar or restaurant. Lousy hotel restaurants are a thing of the past. Now hotels are making sure their restaurants are unique, extraordinary restaurants that even locals want to make as their own hang outs and haunts, often bringing in big name chefs to anchor that experience with extraordinary fare. Personalization then becomes the name of the game: getting to know your clients and delivering exactly the experience they want and need. Customers are looking for highly personalized, luxurious experiences that still evoke a sense of comfort – and are comforting. A hotel restaurant, as an example, might take “experience” to the next level with extraordinary meals made with high quality, local ingredients, that can be created and served table side or in room – incorporating the local flair with custom, direct table side service that allows the patron to engage directly with the master artisan chef. By taking just a few of ideas, find new ways to incorporate more “experience” into your hotel, its restaurant and bar, and you too will find guests craving your unique brand. Complementing your refinishing with a well planned floor is a very effective way to bring out the best of your new remodeled rooms, choose porcelain, ceramic, mosaic, all of them very affordable today more than ever. “We pride ourselves on our stature as a respected partner to our clients. We are results oriented when it comes to our reputation, ambitious to earn the designation of an elite and dependable resource, known not only for the quality of our craft but also for our discretion. We aspire to great heights and expect our clients to demand that of us.” Orlando Salazar, President -Bathtub Doctor. Refinishing will save you time and resources on your hotel bathrooms, since 1986 we’ve been helping hotel managers and engineers achieve their goals of clean, appealing bathrooms thereby maximizing room occupancy, simple things done well can be beautiful. We would love to hear your comments. BOGOTÁ, Colombia & MCLEAN, Va.–(BUSINESS WIRE)–DoubleTree by Hilton, one of Hilton Worldwide’s (NYSE: HLT) 13 market-leading brands, has broadened its presence in Colombia today with the opening of DoubleTree by Hilton Bogotá – Calle 100. The hotel joins the recently-opened DoubleTree by Hilton Bogotá – Parque 93 as the brand’s first two properties in Colombia. Both hotels are managed by Hoteles Cosmos, and the DoubleTree by Hilton Bogotá – Calle 100 is owned by Inversiones Libra S.A.
Set in a quiet section of the Chico neighborhood in the capital city of Bogotá, the ultra-modern, 88-room, full-service hotel offers easy access to the city’s dynamic business district and the grand Autopista Norte highway. The Bogotá World TradThe hotel is ideal for business meetings, weddings and other special gatherings, thanks to nearly more than 16,000 square feet of meeting and event space. Its 20 meeting areas include an amphitheater, executive boardroom and a grand ballroom accommodating up to 1,200 guests. For smaller groups, the hotel offers the Meetings Simplified by DoubleTree by Hilton package which includes the meeting room, basic meeting Wi-Fi, meeting room supplies including a flipchart, markers, extension and power cord, and all day non-alcoholic beverage service. Catering services and a dedicated event staff are available to enhance any event. e Center, Park 93, and Usaquén, which boasts numerous nightclubs, gourmet restaurants and elegant shops, are all within a short walk and Bogotá’s El Dorado International Airport is located roughly less than nine miles northeast. Each stay at DoubleTree by Hilton Bogotá – Calle 100 begins with a warm DoubleTree chocolate chip cookie, and refreshing towel at check-in. The hotel offers complimentary Wi-Fi throughout its public areas and guest rooms and a 24-hour business center/connectivity lounge, plus it is the area’s only hotel offering a 24-hour fitness center featuring Precor equipment, steam room, Irish sauna and indoor swimming pool. DoubleTree by Hilton Bogotá – Calle 100 perfectly balances emblematic design with contemporary luxury. Built to maximize natural light, the hotel offers stunning views of the nearby Andes Mountains or bustling downtown Bogotá from many of its guest and meeting rooms. Its sleek modern elements feature brown and light teal blue color tones, while marble finishes accent the spacious and open property. The hotel’s guest rooms feature high ceilings and trendy décor, with numerous modern travel comforts such as soundproof windows, air conditioning and bathrooms with a marble shower. Guests will enjoy all the comforts of home with a 42-inch HDTV, mini-refrigerator, coffeemaker, multimedia hub and laptop-sized safe. The hotel’s suites offer a whirlpool bath and a separate living area and dining room.